It is bizarre that claims linking vaccines to autism have persisted for more than a decade when they can be debunked by a sixty-second Google search. 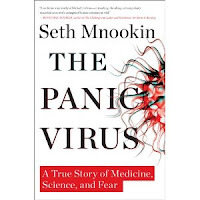 But, as investigative journalist Seth Mnookin explains in his new book The Panic Virus, vaccine facts can't always compete with parent-, internet-, and media-generated vaccine beliefs. The Thinking Person's Guide to Autism talked with Mr. Mnookin about his book, about the risks of complacency regarding public opinion on vaccines and autism, the flaws of modern science journalism, why and how pediatricians need to step up their participation in vaccine education, the tragedy of an autism community divided, and why we need to keep blasting holes in echo chamber walls. It was not because I had a personal connection, which is odd because it's such an emotional topic. But I was shocked at how people were discussing an issue that seemed to me would have to be fact-based, as if it was belief-based. Like many reporters, my first instinct was, "Oh, a juicy story about how the pharmaceutical industry and the government are conspiring!" The ingredients seemed to be pointing towards a Lorenzo's Oil type thing, with a group of parents working against very powerful interests. From the beginning, it was more a combination of a sociological story and a scientific story. People I knew were having this debate. Which is fascinating, because it wasn't people who were directly affected -- it wasn't parents of autistic children, it wasn't parents who believe their children had been injured by vaccines, it wasn't people who worked for Pfizer -- which now, looking back, seems incredible. The Panic Virus is a Gawker book club selection, and has received praise from skeptics like Michael Shermer -- but aren't they already the converted? Who are you trying to reach? It's not that I'm not interested in reaching people who agree with me, but it's easy to create the situation I've tried to critique a little bit, where everyone is agreeing with you in louder and louder language. It's gratifying when people whose work I respect and admire respond positively, and I'm glad that for the most part I've been able to present science in a way that people who know the science don't feel has been dumbed down. But the people I'd most like to reach are the people who sparked this initially, just average parents. To extend that, not just average parents -- another thing in working on this book that I found simultaneously disturbing and fascinating is our cultural lack of curiosity about science, and the ways in which that then affects public policy, and affects our actions. All of that is I think is a big problem, so I wanted to write a book that used this specific narrative throughline as a way to interest people in the way it affects other issues. It seems as though in the past two weeks, with Offit's book on the anti-vaccine movement and the BMJ's declaration that Andrew Wakefield's research was an elaborate, mercenary hoax, we may have reached a tipping point regarding public opinion on the vaccine issue. What do you think? I think that would be great [chuckles skeptically]. Certainly in the last two years when the first round of omnibus rulings [dismissing federal test cases on autism-vaccine links] came out, then the second, then the GMC ruling against Wakefield, every time I thought, "Well, we've reached a tipping point, now there's so information much out there..." and it kept not being true. A 2010 University of Michigan study showed as many as 25 percent of parents still believe that there may be a link between vaccines and autism. I haven't seen anything else with real grounding in data besides a Today show poll from two weeks ago with thousands of people -- many more people than responded to the University of Michigan study -- and it also showed 25%. I think it's really really hard to unscare people. I don't know if I've gotten cynical or pessimistic, and I know that the omnibus rulings were not something that everyone read through or even got that much attention from reporters, but when I read all those decisions, I felt, "Well, that's been settled." I wondered how any self-respecting reporter could read those decisions, and then cover it differently. One thing I've definitely noticed, which is also anecdotal -- and I'm sort of loathe to say something anecdotal as I will then of course turn around and rip the sh*t out of anyone who uses anecdotes for data -- there is a pediatrician near me who now has a clear stated policy that they will not treat people who choose not to vaccinate, they won't space out vaccines, and they won't recommend other doctors for those patients because they feel it's unethical. And I hear that about pediatricians more and more. That happened to us, with our second pediatrician, who cited his Hippocratic Oath. As important as it is for books and media revelations and coverage on Good Morning America, I really do think what is going to make the most difference is pediatricians' ability to communicate effectively with their patients. And another thing that is happening with my own pediatricians is that they're scheduling seminars after hours, sort of office hours for parents to come in and talk about their concerns about vaccines. Anyone who's a parent knows that you just don't have time during a fifteen-minute routine doctor's appointment to address all of your concerns. I do think that the most important thing that could happen is an institutional change on the part of the pediatric community, as sort of whole-sale approach to dealing with vaccine doubts. If you come into a pediatricians office with a child who has autism or not, and say you're concerned about vaccines, and your doctor's reaction is, "Get out of my office," it may make you think, "Wow, they are trying to hide something." But what if they said, "This is our policy. If you want to be with us, we insist you vaccinate your child. Here are resources that we have, here are times you can come and talk to us, if you don't feel like your questions are answered in this appointment, you can make another appointment." The same thing needs to happen in the public health community. The CDC's website needs to be designed for people, not for CDC officials. You need to be able to click on links where the text isn't six point font, and the average number of syllables per word isn't eighteen. I think awareness in the public health and pediatric communities is ultimately going to make more of a difference than any book or media coverage. You showed a lot of empathy for the parents in your book. And I think that's important, to recognize that vaccines are an emotionally charged issue. I just wanted to say I appreciated that, having been an anti-vaccination parent. I love a nice review, when people say I've done a good job -- but the comments and reviews that made me feel like I may have accomplished some of what I tried to accomplish is when people say that exact thing. This is not a book in which parents who are making these decisions are portrayed as believing inexplicably. I've said many times, I cannot say what my reaction would be if I thought my kid had been harmed. I feel like a lot indictment for this goes to me and my profession. I think we deserve a lot of criticism. But isn't part of that what you wrote in your book, that science reporting been decimated? I'm heartened by your book and knowing that investigative journalists are still out there, but isn't part of the problem modern journalism's lack of bandwidth? My concern over losing general investigative reporters is that if there's no one uncovering those stories, then we won't know we're missing them. The issue with science reporting is just sh***y reporting about information. Wakefield is one of those cases. From very early on, from Wakefield's 1998 press conference, there could have and should have been a different way of covering it. And I don't think we need twenty years of advanced training for a whole new generation of science journalists. I think that for some reason there is an acceptance of having people cover science and medicine who know nothing about it. And you wouldn't do that in any other field. You wouldn't have me cover opera, you wouldn't have the opera critic cover business. I don't know why that is oftentimes the case with science. In almost every other area, the excuse for covering A, B, C is that it's a controversial story, and we can't not cover it. With vaccines, for some reason, we get a different take, for reporting on what people say is the controversy first and then weeding it out later. And this gets back to the issue of "unscaring" someone. Once it's out there it's really hard to backpedal. I think scientists need to be aware that it is part of their job, telling the public what they do, in the same way it's part of a baseball player's job to entertain the public. They can't do it in a vacuum, you can't have science, labs, funding, universities without a greater society built around it. Part of your job as a scientist -- if you want to continue to be able to do good science -- is to communicate with the public. And it's hard to speak Science in English. Part of the issue is that we as reporters need to acknowledge that if we don't understand the science, that we should wait until we do to write about it. And I keep going back to the initial Wakefield paper in 1998. A lot of people disagree with me from the journalistic community, but I think the initial coverage was total crap. I got in an argument the other day with a person who said, "It's in a respectable journal. It's in The Lancet. So how could we not have reported that?" When first of all, there's the whole issue of The Lancet not being in the press conference and trying to make clear what the limitations of the study were. My feeling is okay fine, if you want to report that because it was in The Lancet which is legitimate thing, then your take should have been why the **** The Lancet was running a paper on a twelve-person case series, and tacitly allowing the researcher to go forth and say these ridiculous things when everyone knows it's preposterous to make policy recommendations based on a twelve-person case series. Being able to explain a case series to a reader is not like quantum physics. A lot of this is not as difficult as we might think. And editing has a crucial role as well. Having one good editor and ten mediocre science reporters can be the equivalent of ten good science reporters. How did we get to a point where someone like Wakefield, whose research has been repeatedly debunked and whose medical license has been taken away, is considered by the media to be on equal footing with mainstream medical and research professionals? Where that is considered balance? That is something I rail against and am obsessive about. I talked to Dr. Richard Besser, an ABC News medical editor, whom I found to be hugely intelligent, and there's Nancy Snyderman on NBC, who is outspoken, doesn't do the namby-pamby "on the one hand, on the other hand..." crap -- and still ABC and NBC end up with stories about both sides, you still end up with Wakefield on TV, getting a chance to present his case. And because Wakefield does this game of whack-a-mole, it takes three hours to go through everything he says. Anything you bring up, he says, "Yes, but other independent researchers have confirmed my studies." And then you have to talk about how these people are not in fact independent researchers. And then he says "Brian Deer was funded by so-and-so" and it's this multi-headed beast where there's never an adequate answer to all of the questions. I don't necessarily fault ABC or anyone for covering it now, because it is a big story. There have been fourteen years of scares. But I think that does demonstrate how hard it is to unring the bell. Because inevitably, any time you get Wakefield on TV, there will always be some percentage of people who see him and think, "that does make sense," or "I don't trust those companies." Were you surprised that Salon cited you in the statement fully retracting RFK Jr.'s 2005 article Deadly Immunity, which was a joint effort with Rolling Stone, and which linked vaccines to autism? Rolling Stone completely scrubbed the piece from their site while I was working on [The Panic Virus]. It was there one day, I had the URL, and the next day, it was gone. What was so shocking to me about it was that, after Salon initially ran 500 words of corrections, Rolling Stone ran a really aggressive statement that said "We have been attacked by the mainstream about this, and none of the corrections undercut the main point of the story," which is astounding, because when you read that statement after the corrections, which basically said, "This is wrong, this is wrong, this is wrong; this is misquoted," was mind-boggling to me. So I talked to the editors at Salon after the Rolling Stone piece disappeared from their website, and while I wasn't filled in on the editorial discussions, when I started the Q and A with Salon, they said they were discussing what to do. I think [the retraction] was a ballsy move on their part. It's much more common to see Rolling Stone's response than to see Salon's response. Tell us about the self-reinforcing cycle of the “availability cascade" and how it has affected popular opinion about vaccines. It's interesting, and it's one of the reasons why I'm so cautious about getting caught up in what I know, and about how people are going to respond, and thinking that everyone agrees with me. An example of how availability cascades have come into play here is the demonizing of pharmaceutical industries, and the assumption that if you can't trust the pharmaceutical industries, then you can't trust whether vaccines are safe. Which just seems so ridiculous. It's like saying you can't trust the makers of car companies, so then you can't trust the highway administration. We're not relying on vaccine makers to tell us that vaccines are safe, we're relying on governments, public health infrastructure around the world, and scientists. That's an example where a notion can take off. You can't trust the drug companies, and the drug companies are peddling these vaccines, and it can snowball until what's actually going on in this situation gets totally lost. When the notion that there was a connection between vaccines and autism started to come up, and it started to come up in the parent communities, there was no other perspective, really. Because if you were a parent who was wondering whether your child's condition was the result of vaccines, there's no reason to have someone saying "no that isn't what happened," because you wouldn't be on that forum or you wouldn't be having that discussion you didn't believe the link was possible. So it's incredibly easy to all of the sudden feel like, "Well, this is what everyone thinks, this is what everyone has seen," It will continue to make me look at the ways in which I fall prey to that. Because I do, everyone does. Yes, you talked about that, about confirmation bias -- about the point at which you believe you're right being the point at which you need to start looking for the holes in your beliefs. Exactly, and this is something I try very hard to be aware of. I know there are probably errors in my book, because that's inevitable, and I know there are legitimate criticisms, but it's very hard for me to hear those on an Age of Autism comment thread, because when people start saying really horrible things about me, my reaction is to think that everything they're saying is equally ridiculous. It's really painful to have people be that angry and that nasty. And so unfortunate. I had a conversation with Jane Johnson from the ARI and Thoughtful House about Wakefield leaving the latter, and she said one of the reasons was that there were things Thoughtful House wanted to do and partnerships they wanted to pursue, and it was impossible to do them [with Wakefield on board]. The underlying thought there, is that you have all these [autism] groups that share a common goal of helping families and helping kids, fighting with each other. I don't think there's anyone who would disagree that families whose children need ongoing care that don't get the support they should. But instead of being able to say "This is something we all agree on," it's always "vaccines vaccines vaccines." I think a big reason for that, for people who are really really convinced that vaccines cause autism is because it's been so difficult to get consensus on spending money on something else. Let's find something else we all agree on. I find it all very sad. It is, definitely. It's another reason we started The Thinking Person's Guide to Autism, to provide centralized evidence-based information that wasn't available when our kids were first diagnosed. I think there's a real onus on all of us in the autism community to get past the vaccines, and emphasize how much we have in common. Yes, it's also wrapped up in the treatment issues. It's so hard to find common ground. But I think one of the reasons I was glad to be coming at this from my [outsider's] perspective, is that I could go to Autism One and spend time with hundreds of parents who aren't posting ten times a day on the Age of Autism message board, who aren't leading the local TACA chapter. There's just a sense of exhaustion and yearning for sense of relief, something they can work with. And to then leave and know that this group of people is going to leave, and be set up as if for war with a group of people who are looking for the same thing; I just find it really upsetting. I hope that vaccines become no longer an issue, because besides going to the conferences and talking with parents whose children are affected by autism, there's talking with parents whose children have died from vaccine-preventable disease -- it's hard for me to even think of those conversations without crying. We shouldn't need to have parents who need support set against other parents who need support. As a relatively new father yourself, what would you like to say to parents of infants and toddlers who still see mercury as a real risk and vaccine-preventable disease as theoretical? I try to be as understanding and empathetic as I can, but the mercury thing drives me up a wall. There was never mercury in the MMR vaccine. When I'm out with friends, and someone brings it up -- I feel as though they're not trying to make sure they are in the slightest way informed, and are perpetrating misinformation. It's not like finding out whether there's still thimerosal in vaccines takes time. It's a 90-second search. Then there are people who ask "What's the harm in spacing out vaccines" which I feel is like saying, "Well, we have a new car. Why don't we start with wearing a seatbelt, and then we'll start using the side airbags in six months, and then the front airbags in a year." These things protect you! Every day you don't have them is another day you're at risk. It's much worse for a one-year-old than a five-year-old to get measles or mumps. The whole point is, you want to protect your kid as young as possible. Thank you for including the story of families of children with severe autism like Michelle Cedillo [a subject of the first vaccine injury test case in the federal omnibus proceedings]. These families are often presented as deluded when seen without the context you provided as to the severity of Michelle's disabilities, and how difficult her family's life was as a result. These are desperate people who need support, and aren't getting it. It's so hard to talk about this without being condescending, but you look at the Cedillos, and if ever there was a family who needed support, that is the family -- and they're getting that support, through the Age of Autism, they're getting hundreds of people rallying around them and giving them emotional support. Someone who portrays the Cedillos as being lunatics or out for money is someone who also hasn't bothered to do their research.